﻿ Do Snakes Have Bones? A snake is in-fact a vertebrate, but this bears the question whether they do have bones or are they just wrongly classified. Well in consideration of how flexible they really are, it's no doubt that most of us wonder if they really do have bones. Well they not only have bones but have a rather complex skeleton, with a load of bones and joints. Some of the bones in the skull are named similarly as those in the human skull. 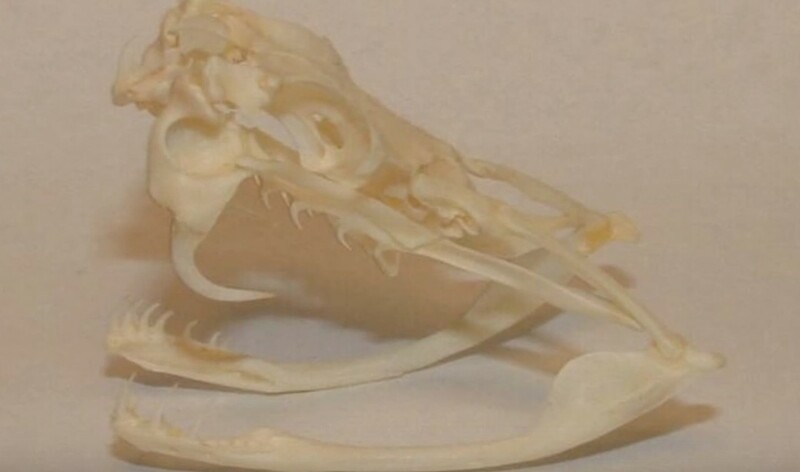 The multiple joints in the skull do come in handy when the snake is swallowing its food allowing it to extend and stretch. Snakes also have teeth on a jaw bone. The vertebrae on the snake's backbone are highly flexible which allows the snakes amazing movements. The vertebrae are commonly attached to two ribs. The number of vertebrae in a snake differs from species to species. •	Precaudal vertebrae - which are numerous of which some, have curved ribs which are movable. •	Lumbar vertebrae - these do not have ribs. Snakes do not have limbs like other animals therefore they use the muscles of their body and highly flexible bones for movement. Of what importance are the bones? •	They clearly support the muscle which helps the snake move about. •	Some of the bones like the jaw bones are very strong enabling the survival of snakes. •	The bones of boa constrictors help support them when constricting and smothering their prey in readiness for consumption. This may be a very intriguing subject. You may even feel tempted to and catch a snake, skin it and study its skeleton. Apart from this venture being seriously dangerous for you, it may also land you in trouble with local wildlife control. Do not take unnecessary risks. Read the How to get rid of snakes page for helpful information and to learn more about Do Snakes Have Bones? We are wildlife removal experts and educators, who want to inform the public about the proper methods for safe, humane wildlife control. By reading the tips and techniques described in this website, you can solve many common critter problems by yourself for free. If you need professional help, we service over 500 locations throughout the USA. Click here to hire us in your town.